This has produced a situation in which Maitreya can step forward into public work without infringing humanity’s free will. Patiently has Maitreya waited many years for this time, sure in the knowledge that the events now taking place would, indeed, transpire. Commercialization has bared its claws and shown its power to harm. The complacency of millions is turning into hatred and distrust of commercialization and the old order of things. Men everywhere are at last ready for a new interpretation of the meaning and purpose of life, for sharing, justice and peace; for right relationship, brotherhood and greater happiness. They are ready, at last, for Maitreya’s call. Those who are ready will quickly respond to Maitreya’s Teaching as He puts into simple and eloquent words their heartfelt needs. Others will take longer to forgo that to which they have become accustomed, and for a time disagree. In time, millions around the world will see the need and the logic of the changes which alone will save the planet and its people. Q. For more than 20 years Maitreya’s public emergence did not take place because there had to be a worldwide stock-market crash first. Maitreya forecast a crash in 1988. Finally there is a stock-market crash, and people around the world now can see the need for change that Maitreya calls for. Still there is no public emergence. Now there is a ‘star’ in the sky heralding his appearance, but there has to be a public debate about the meaning of the ‘star’ before his emergence can take place. I don’t understand why there seems to be a new condition now for Maitreya’s emergence. Can you explain why this is happening? A. As you say, Maitreya did indeed forecast, in mid-1988, a world stock-market crash which He said would begin in Japan. In 1989 the Nikkei stood at 40,000 points. It suddenly collapsed to 7,000 points. Today it hovers around 10,000 points. Maitreya called the Japanese prosperity up till 1989 “a ‘bubble’ which inevitably would burst”. This was followed by the collapse of the markets in the countries of the Pacific rim: Thailand, Malaysia, Hong Kong, Singapore, Indonesia. Then the markets collapsed in Russia, Brazil, Mexico and Argentina. America and Europe have survived a series of ‘near-miss’ collapses until the latest debacle. Do you really imagine that Maitreya can emerge the very next day? What He has given is a “star-like luminary of brilliant power” as a Sign, a Herald of His Return. He desires that there should be open discussion on media to create a general expectation of His Emergence. I have not said that His Emergence depends on that. It does not, but obviously it would alert millions to what is happening. You know about and, impatiently, expect to see and hear Maitreya but billions of people do not. Do they not also have the right to know? What better way to tell them about Maitreya and, at the same time, affirm the reality of the Space Brothers and their spaceships, the so-called UFOs? My colleagues and I have strained every nerve and sinew for many years making this information known. We do not put a date on Maitreya’s appearance; we know He is here and that He will emerge openly at the earliest possible moment. Q. I was at your London lecture on 23 April 2009 and you spoke very urgently about the need to get the existence of the ‘star’ into media outlets (radio, television, the internet, etc), so that there is an open public discussion/debate about its meaning. Why is that so important? A. As Maitreya says: “Nothing happens by itself. Man must act and implement his will.” Maitreya desires as much public discussion as possible otherwise the function of the ‘star’ in heralding His approach, is lost. Q. I have been following the news about the ‘star’. I am very much hoping that what people are seeing is the miracle star. But I am wondering whether any unusual sightings have been reported by people who spend their days looking at the stars through giant telescopes, etc. Were the scientific community to observe something new I would be reassured that it is not simply Venus being mistaken for something more unusual. Has this happened yet? A. The response from professional stargazers has been a deafening silence. Why the silence? Are they following governmental orders to keep quiet about any unusual sightings (like UFOs)? On the other hand, reports of sightings have been flooding in from all over the world – from Norway to New Zealand and the USA to Japan. YouTube is full of reports, many of the ‘star’ although the reporter usually has no idea what, in fact, he is seeing. Some earlier reports were indeed about Venus, but since 28 March Venus has gone beyond our sight. So now there is no confusion. 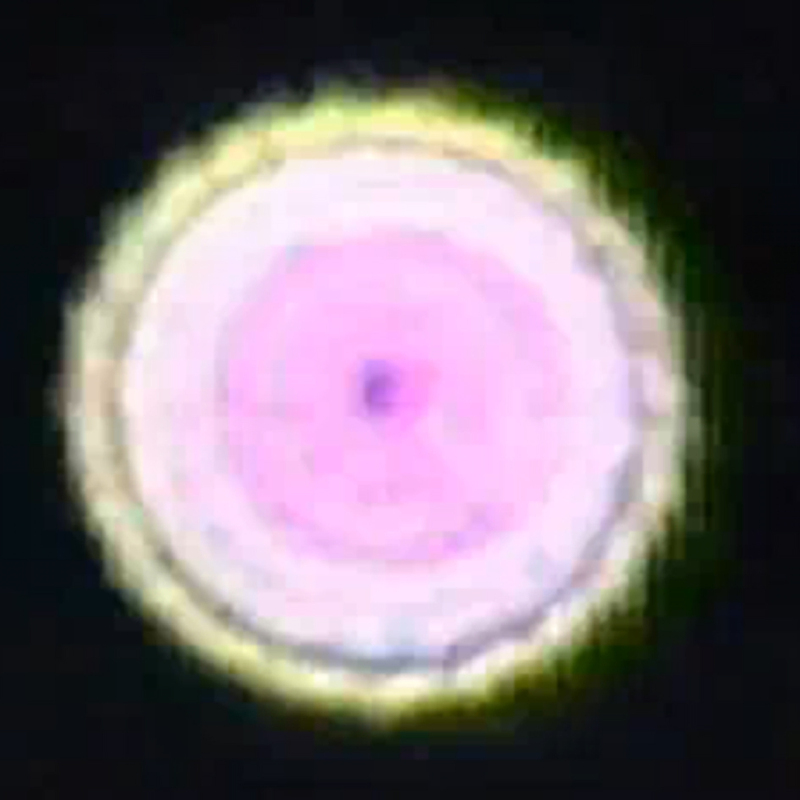 The ‘star’ is brighter even than Venus, changes colour frequently and moves position. So obviously it is not a real star. There are, in fact, four such “star-like luminaries” covering the world. They are gigantic spacecraft (each one about the size of five football grounds put together). They all come from planets of our own solar system. They are a sign, heralds of the first public appearance on American television of Maitreya, the World Teacher. Q. Thanks for all of the great work that you have done so gracefully for so many years. I have one question that has been gnawing at my mind for several weeks: why have you been calling the light in the sky ‘the star’, while some of your regular readers know it is one or more UFOs? It seems that many people would quickly become very confused by your references to ‘the star’, especially after they look at the photographs (and accompanying text) on the Share International website that clearly indicates that it appears and disappears in a wide variety of different locations, colours, and forms, and that it moves around randomly (unlike any other star) like a spacecraft might. To my mind calling it a‘star’, makes it all too tempting for the public (including all those who are open to UFOs), to dismiss the story as baloney. So, why not cut out the pretence and call it a UFO? A. There is no pretence. Knowing the nature of the ‘star’, as four gigantic spaceships from several planets of our System, I had great difficulty in deciding just how to present it to the general public and media. I decided to follow my Master’s example. He had called it a “star-like luminary of brilliant power”, and related it to the ‘star’ which led the ‘three wise men’ to the birthplace of Jesus. Some of us know that that ‘star’ was a spacecraft too, but is accepted by millions as a miracle star. It was just before Christmas so I called it a ‘Christmas star’, sure that that would be more interesting and magnetic than a prediction about a UFO. In Britain at least, people are much more sceptical of UFOs than in the USA, for example. Of course, at each lecture I make it clear that what looks like a star is, in fact, one of four huge spacecraft. In a lecture, one has time and opportunity to enlarge on the subject and the meaning and purpose of the phenomenon. In a press release or advertisement one is limited by space and the need to be succinct. The result from the public has been encouraging – eager and excited and amazed by the sheer beauty of the spectacle. The response of the media has been almost nil, as if there was an embargo on mentioning something so important as the herald of the Christ. However, it could be that media interest is starting now. Thank you for your kind words. Q. Many people in foreign countries have had the pleasure of seeing the ‘star’, but I don’t think it has been over England very much. I live in the south-east, and I haven’t heard of anyone seeing it here in my area. So often the skies are cloudy, but I look every day and night for it. Is it likely to come here again? I have downloaded the photograph of it over Oslo, and given it out to many people in the hope of spreading the news of Maitreya. God bless you all at Share International. I love the magazine. A. We have some excellent photographs sent in to Share International by people in these islands, but our cloudy skies are certainly a hindrance. However, keep looking and, if possible, take pictures. 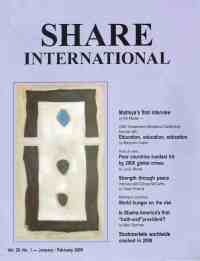 Thank you for your comments on Share International magazine. Q. I have noticed that Benjamin Creme’s lectures are running throughout 2009. Why would we need more lectures? After we all see the ‘star’ won’t Maitreya be the main speaker or is the star going to run its show for another year before the appearance of Maitreya? I have been an amateur astronomer for 25 years. Stars are suns, they don’t move in orbital cycles. Would you care to enlighten me on a star that moves? Maybe it’s another object that has a projected orbit? A. Lectures are given to inform new people of our information. That means about 6 billion people who still have not heard what is happening in our world. The ‘star’ has a limited period as a sign of Maitreya’s presence and first public interview. Stars, as you say, do not move. Nor, I think, do they change colour constantly and disappear at high speed. 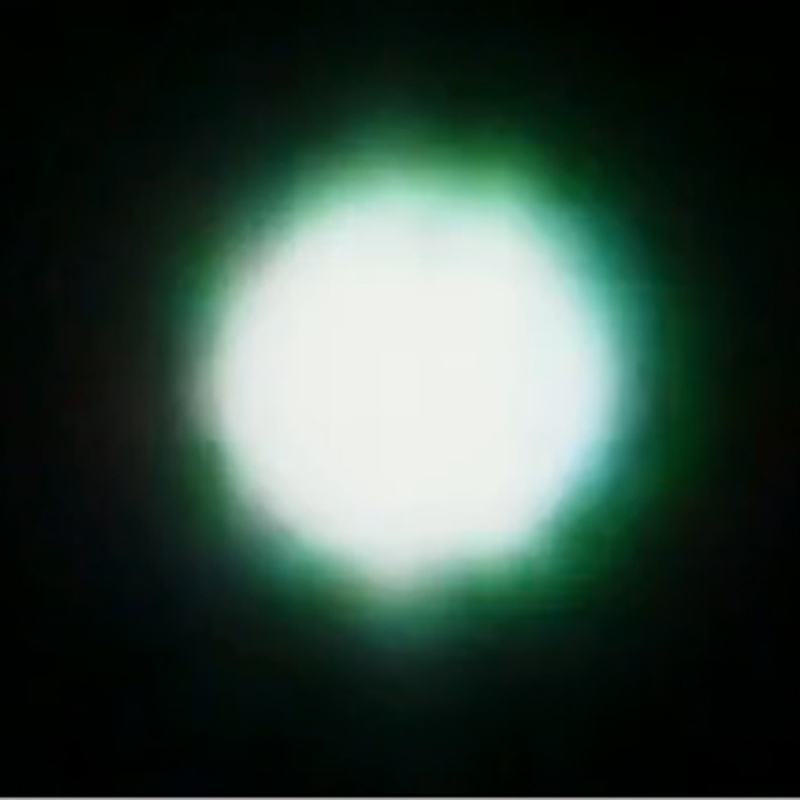 There are four “star-like luminaries” which are now seen by many people around the world. They are huge spacecraft from different planets of our solar system. Their presence among us is further proof of the reality of UFOs and intelligent and harmless life in our own solar system. Q. (1) In what way can you recognise the ‘star’ sign and not get it mixed up with celestial bodies? (2) I know it is seen in the west. Does it move in any way? I’m looking for it in my vicinity but don’t think I have spotted it yet. Is there a chance it would make a wee cheeky appearance over Scotland anytime in the future? A. 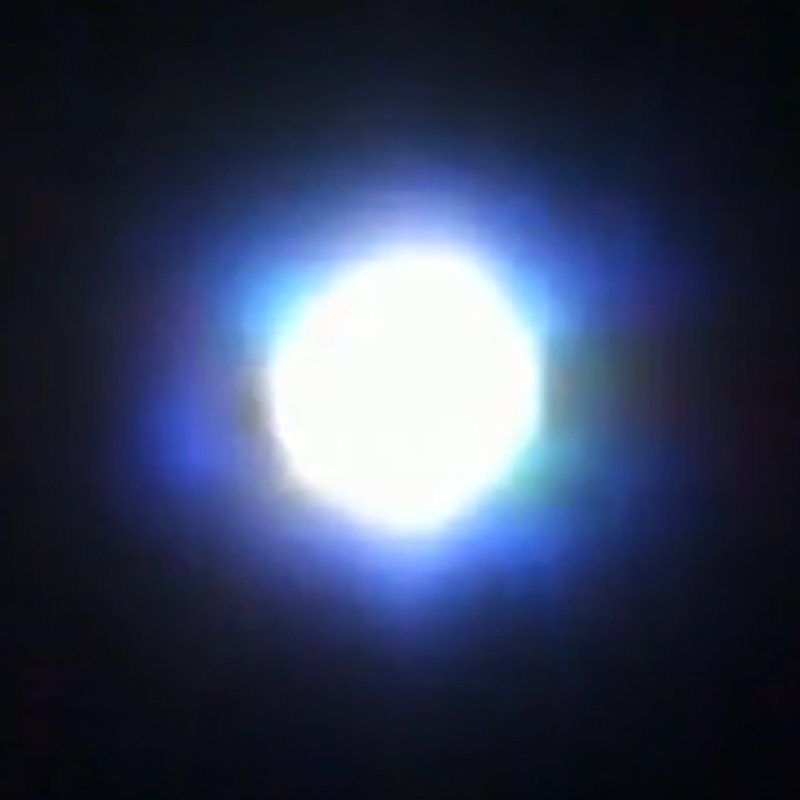 (1) For a start, it is very bright, brighter than Venus, changes colour and moves. (2) I don’t think we have had reports from Scotland but we have from Canada and New Zealand where many ex-Scots live, as you know. I will see if I can do anything for a magnificent sighting over Glasgow, my dear old birthplace! Q. When I was staying in a house in the Brazilian state of Minas Gerais, in March 2009, I noticed a handprint mark on my bedroom window. Back at my home in São Paulo, I realized that there were also some fingerprints on my own bathroom mirror. (1) Were these handprints manifested by Maitreya? (If yes, it’s becoming a frequent phenomenon in my house!) (2) Is this a sign that Maitreya’s appearance is near? 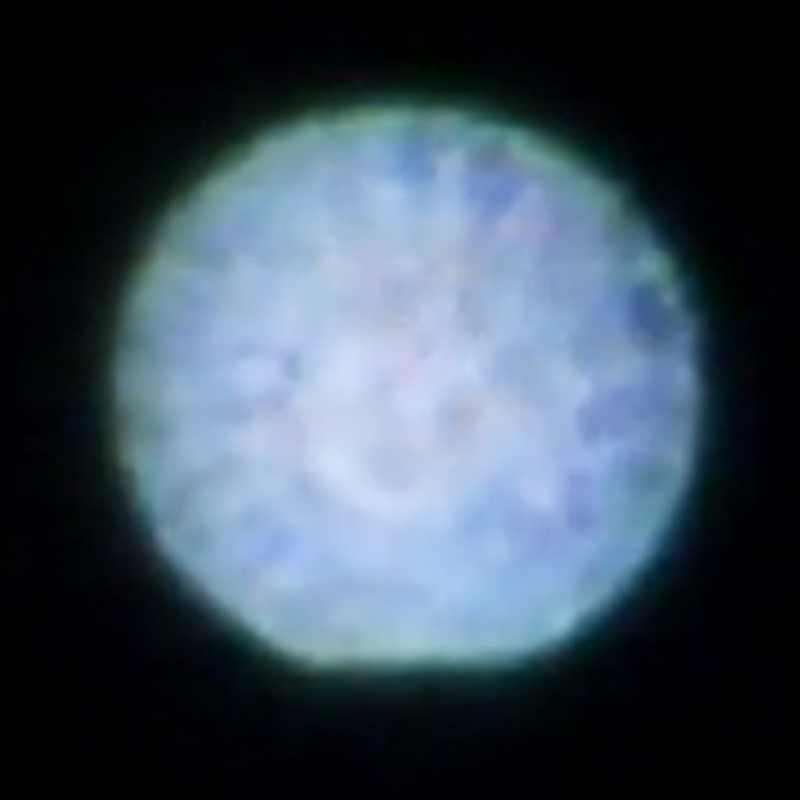 (3) On 14 April, at 21.30, I was coming home in São Paulo, when I saw a strange star that was changing colours very quickly, and then disappeared. (3) Was it the ‘star’ and did anyone else realize it was there? 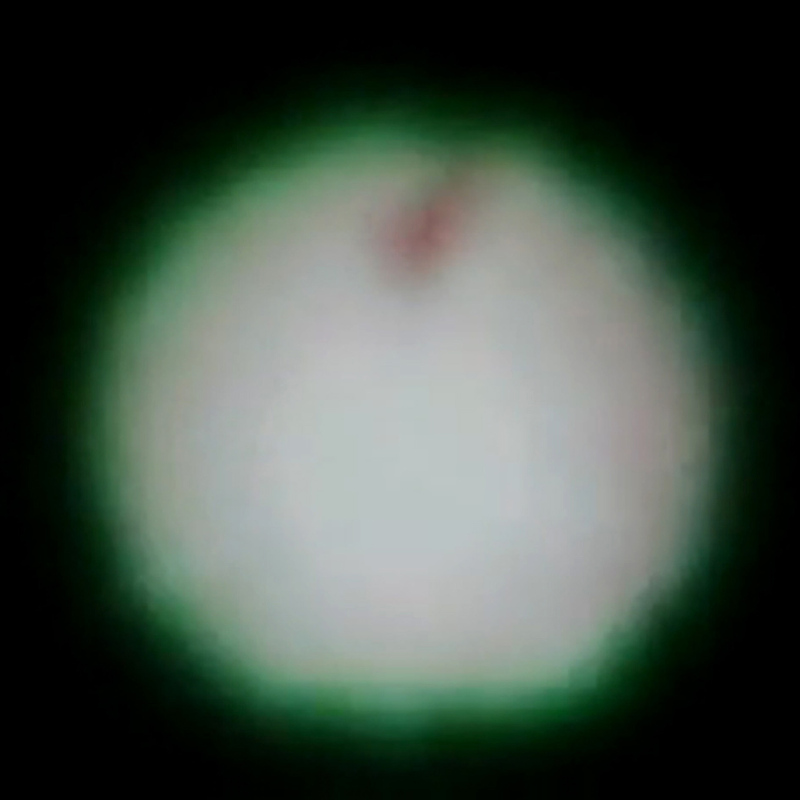 (4) Also, on 6 April 2009, outside my home, I noticed an object in the distant sky outside my home. It was emitting a light at times and I remembered that some people who had seen the ‘star’ had asked it to become brighter. I decided to do the same: when I did it really became brighter even when the object was behind the clouds, and was brighter only at the times that I asked. It was a great moment and was like a confirmation. Was it the star? A. (1) Yes, it is a Sign of His Presence. They are appearing in many parts of the world. (2) YES, very near. (3) Yes, the ‘star’ and many others saw it. (4) It was the ‘star’. Q. I saw the photograph of the ‘star’ on your website, taken from New Zealand. If something unusual is spotted in our skies, it is normally all over radio talkback programmes and the media, immediately. Not a squeak so far! If this ‘star’ has been seen from so many countries, it amazes me that astronomers haven’t been speaking out and discussing it, by now! The fact that they are not, seems illogical. I have been searching in vain for comment from the local astronomy community. The deafening silence does not inspire confidence! I hope with all my heart that there is such a ‘star’ but for now I’m finding it hard to accept! A. I agree. It is quite extraordinary, this media and professional silence. The ‘star’ is seen all over the world, sometimes even in broad daylight, yet the media and astronomers alike refuse to speak about it. It begins to look as though they are following instructions from somewhere. Q. I have been reading about the ‘star’ sign on your website. I asked my uncle about the new star but he was unable to find anything more about it, even though he has some fairly advanced telescopes and photography equipment. He cannot find the star in the sky (he lives in Toronto, Canada). Is there any way you can release some astronomical information on this ‘star’ so we can get a better look at it? I know you already have some photographs on your website though they do not seem to contain enough context to determine where the ‘star’ is. A. Look for a star-like brilliant light which changes colour, moves and sometimes just disappears. It is not a real astronomical ‘star’ but a spaceship. 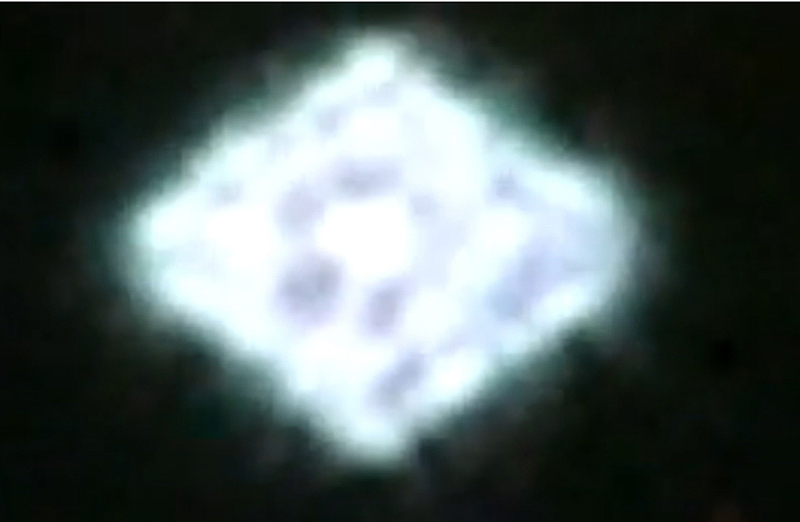 Q. I saw what I thought was the ‘star’ about 8.45pm on 14 April 2009 when coming out of a Transmission Meditation session in Ladbroke Grove, London. 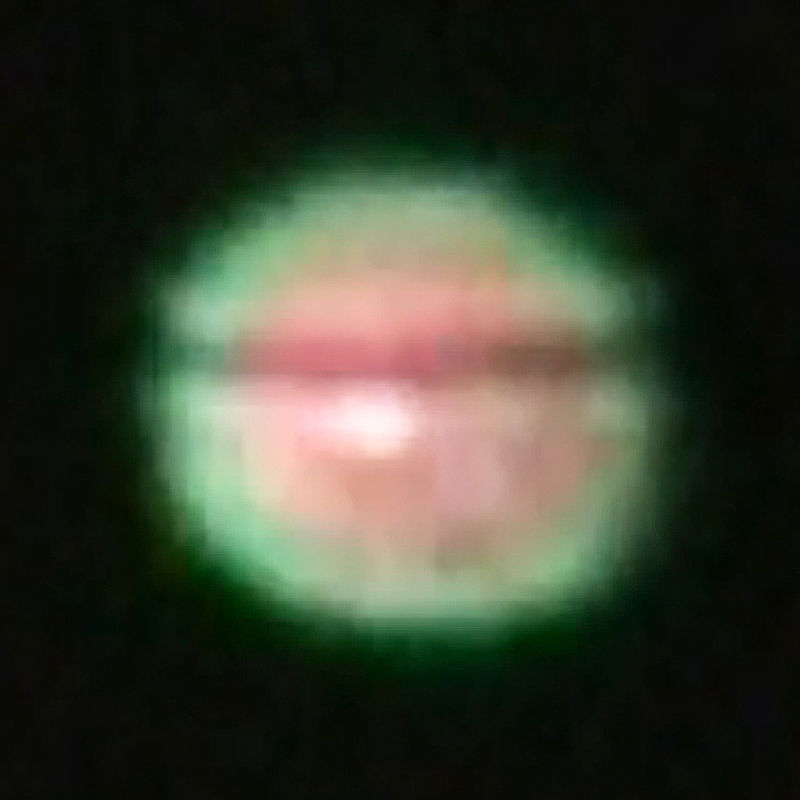 It was in the western sky quite low down, very bright like Venus has been recently. I travelled by underground to my home, which took about an hour, and could still see it. Was it the ‘star’? A. It was indeed the ‘star’. Q. At the meeting of the G20 in London in April 2009, world leaders announced they would dedicate US$1 trillion (1,000 billion) to stave off a lengthy recession and reinvigorate the economy. Will this slow down the eventual collapse of the global economic system, hence maintaining the status quo longer? A. No. The old methods no longer work. We are facing a new time and therefore need new approaches to the problems of the time. Q. Could you please comment on finding a proper balance between detachment, compassion and right relationship as regards to my non-meditating friends? For the past couple of years of working with my group, I find that my friends who don’t participate in meditation are continually feeling hurt in my relations with them. A. If you are really detached you are in right relationship. It could be that you are somewhat less than patient with your friends who do not meditate. It has to be done voluntarily, from free will. Q. (1) Could your Master express His opinion on a very difficult scientific issue, that accelerating green technology development as much as possible will not suffice to fend off the dangers of global warming, an opinion recently expressed by persons like science journalist Sharon Begley and eminent scientist James Lovelock? (2) If so, would he suggest the method of reducing agricultural waste to charcoal by burning it in a low-oxygen environment, thus sequestering the carbon that the plants took from the air as they grew in solid form? (3) Or would he agree with Freeman Dyson, one of the smartest people in the world, that we should stop worrying and that the problem will turn out as big a dud as did the Y2K computer code issue at the start of the millennium, thus reassuring persons like myself whose own opinion keeps fluctuating back and forth? A. (1) Yes. There are other factors besides global warming, for example, deforestation. The loss of so many ancient trees has resulted in a huge oxygen loss which must be restored. Also, pollution is a major problem, above all, higher levels of nuclear radiation which our scientists have no technology to measure. (2) Yes, that is one thing we could do for a start. (3) No, that attitude from one of the “smartest” people in the world would end in total disaster. Q. A few months ago during a Transmission Meditation, I had a vision of a dark-robed being with an intensely blue, glowing oval where a face should be. This being came to me, reached out its hand and did a quick series of scratching-like gestures on my left side, under arm, where the spleen is. Then I felt a surge of energy on my left side. The being then left my closed-eyed vision. During this, I kept in mind that no hostile forces are allowed to mess with Transmission Meditation. Otherwise, I would be quite scared, but I fortunately maintained my focus, kept meditating and let the being do its job. Later I learned to my surprise that the spleen controls an inflow of energy into the blood and that such a scratching-like gesture is used in kinesiology, for example, to adjust the energy. (1) Was it a deva or a human-like disciple of the Masters? (2) Was this an etheric or astral being, thus seen through astral or etheric vision? (3) Do these beings really look like that, or was it just my imperfect vision? (4) Is such care usual? I often feel like someone tingles me on my arm or knee, if I lose focus in meditation and fall into reverie. (5) How would I avoid the danger of overstimulating the ajna chakra, if I’m focusing there during the day to speed up my mental polarization? So far, it rather makes me a bit dazed, which I’m glad of, but also worried. A. (1) It was the Master Jesus. (2) It was etheric. (3) It was neither, but a deliberate disguise. (4) Yes. (5) My advice is to relax – don’t become a fanatic! Q. I feel quite intimately the sincerity/truth of much of what you are telling the world is about to happen. However, I am in very grave doubt as to your suggestion that the Bible (King James version) is largely accurate about the life of Jesus. As you would know, there is no historically verified account of such a man: the myths surface only decades, if not generations, after his supposed death. So, to endorse such Biblical accounts has me wondering as to how much you are accepting on blind faith alone which would, inevitably, cast doubt on the validity of other issues you comment on. Perhaps on this one matter your own, personal belief system interfered with the generosity of your visions of the coming good. I mean this not as critique, but as an honest query. Please do rethink the matter: science and faith need to move in tandem in this age – on all issues. A. I must make it clear that I am not speaking/writing from a ‘belief system’ of Christian faith. I am an esotericist and am giving the knowledge, admittedly hidden until now, of the events of that crucial period in our history. Now, we are to witness the return of the Christ, no longer through another (Jesus) but as Himself in every way. The Master Jesus, as He is now, will be among the first of the Masters to follow Maitreya into public view and work. Then you will see Him for yourself. Q. This is not so much as a question but a statement/thought. When our children see how hard their Mom and Dad worked for so many years only to face bankruptcy, job-loss and poverty, our children will determine that hard work does not pay off. How do I keep my son from this reality? My son is also a hard worker and I know he questions the future about seeing the fruit of his labour. This stark reality for millions is that hard work does not pay off. I am married to a disabled Vietnam Veteran and was laid off my job in January. I am trying desperately to find a job to no avail. I will be SO GLAD when our TEACHER ARRIVES! Thank you for your time. A. Thank you for your letter but I’m afraid I am not in agreement with your conclusions. When, through guidance from Maitreya, the World Teacher and the other Masters, we set to rights our economic and political systems through Sharing and Justice, your children and millions of others will be inspired to work for the benefit of the world rather than for “the fruit of their labour”. The young are full of idealism when they see a sane and fair world. Meanwhile, I hope that you find a job soon. Q. I’m kind of confused. You speak of Maitreya like a god but he wants to be approached as a brother, why is that? A. I have indeed often spoken of Maitreya as a God-like man, but, at the same time, I have always sought to show that He is a man, like us only Perfected. So Perfected, indeed, that He is the World Teacher, Head and Leader of our Planetary Hierarchy, a Christ, a Buddha, a mighty Avatar. On 5 April 2009 the popular programme Cuarto Milenio (Fourth Millennium) on Spanish television channel Cuatro, reported on the ‘star’ sign. On 25 March 2009 at around 11.30am, at an estimated height of between 700 to 1,000 feet, I saw a large, very bright star-like object in the sky above Wellington harbour. The star appeared to be quite stationary, neither moving towards Wellington nor receding away from it, but appearing to bob gently up and down and side to side, as though riding on air currents. At the same time it was twinkling and sending out gentle beams of light. Although this region of airspace is near Wellington airport, even at night the landing lights of aircraft approaching have never appeared so large and lustrous as did the star at 11.30 in the morning on a bright, sunny day. I wonder if you could tell me whether this was the ‘star’ sign mentioned on your website? I live in Barquisimeto, the capital city of Lara state, in Venezuela. 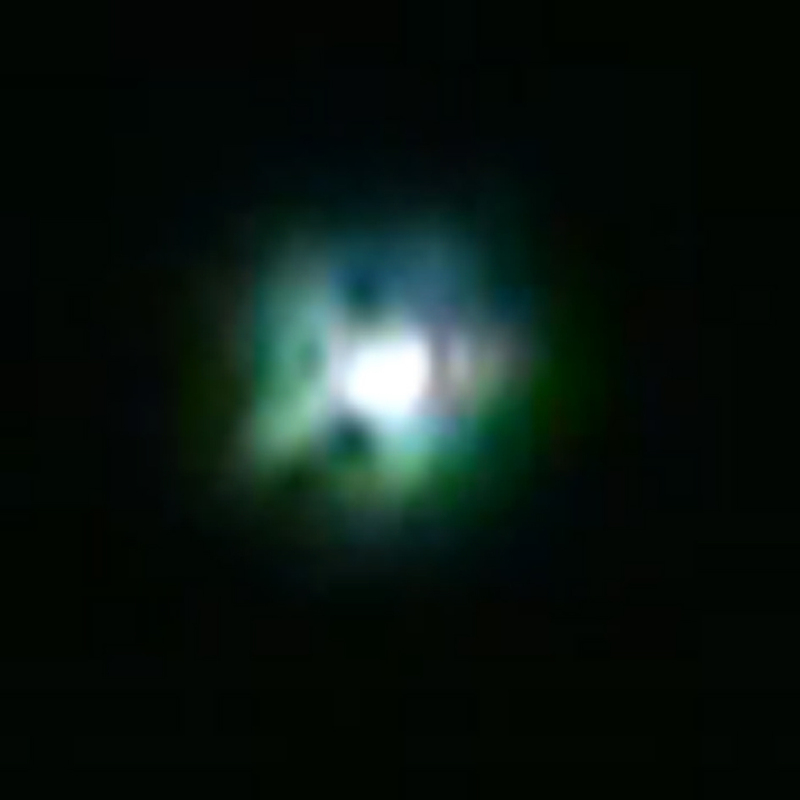 In early January 2009 I saw a bright star (similar to Venus) in a deep blue-green sky for a few days, in the west. I would like you to confirm if it was the star, because I believe it was. On 26 December 2008 between 8.15 and 8.30pm I was walking the dog with my daughter. The sky was beautiful and there were many stars. My attention was drawn by a large red/orange light object that moved slowly forward in the direction where we were going. The object had the shape of a Christmas star and was coloured red and orange. Then it seemed to be above us and to move ahead of us and upwards in an oblique line at a somewhat higher speed. I was very impressed by this star. (1) Was it related to Maitreya? (2) On 30 December about 7pm I saw an enormous star in the sky, bright and very overwhelming and moving very slowly. 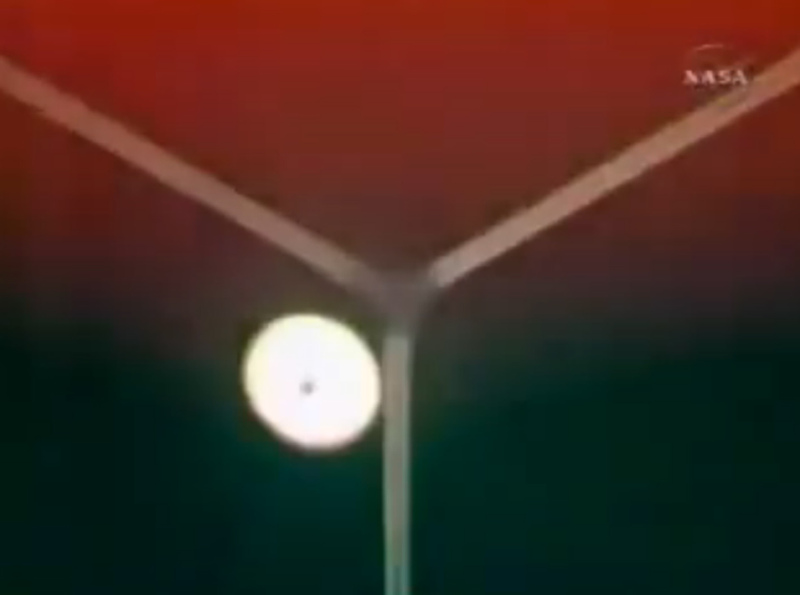 Was this star also related to Maitreya? At our group’s fair stand on 4 April 2009 a lady, Mihana Rose Rodin, told us she thinks she has seen the star on two or three occasions. The first time was about two weeks ago in the early evening. She felt strongly drawn to a star in the west that was about halfway up the sky. She initially thought it was a reflection of the sun. The colour seemed to change – at one stage it had a bluish tinge with rays beaming outward from it. On another occasion she came back five minutes later and it appeared to have moved. A friend of hers also commented that she had seen an unusual star in the sky around the same time. Could your Master please confirm whether this was the star? 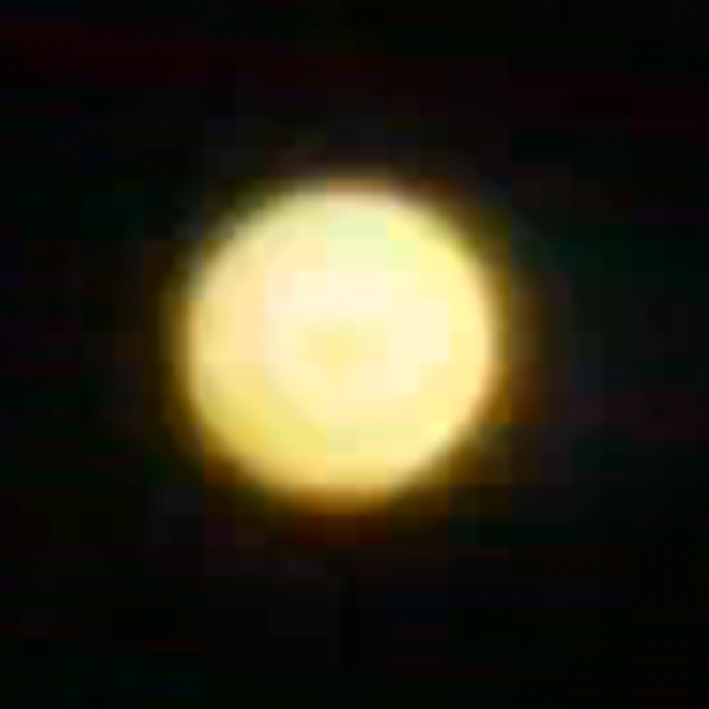 As I was walking home on 9 April 2009, I thought I heard someone say “take a picture”, so I looked through my mobile camera to find the ‘star’ moving around the moon. I rushed home and all three of us, my son, daughter and I stood outside in our veranda, and watched the sky in awe through our mobile cameras. Attached is a photograph taken by my daughter. Was it the ‘star’? K.W., Nishi Tokyo City, Tokyo, Japan. On 1 January 2009 around 6.50pm, I left my sister’s house in Goirle to catch the bus home. As I was walking to the bus stop, I discovered a bright luminous spot in the dark sky. When I took a good look at it, I noticed a rectangular kind of frame with a bright red light which seemed to be brighter towards the centre, as in a fireplace, with flames extending out ever more fiery from white to red. In its centre I saw a bright star with four rays, which shone as bright as a mountain crystal. Out of its centre a very bright, white light extended from the star in all directions. It seemed to me as if the light spread from a circular core with which the centre of the star was connected. The rays of the star looked like elongated pyramids, but instead of being pointed at the top they were rounded as ellipses. It was a marvellous sight and I was looking at it thinking “Wow, how is this possible? This isn’t real.” But deep inside I knew it was real. Then I saw the star move across the sky from my left to my right before accelerating to a tremendous speed and vanishing from my sight. This all happened extremely rapidly while I saw it get ever smaller, as if it was being pulled back up by the universe. Finally, a dot of light was all there was left of it. On 30 December 2008 at 10pm I was looking at the stars in Scherpenzeel (the Province of Gelderland), when a luminous, bright orange object drew my attention. It was like a star, but much stronger in intensity, and it continued to grow. The object flew slowly southwards, then suddenly turned slowly back and vanished. 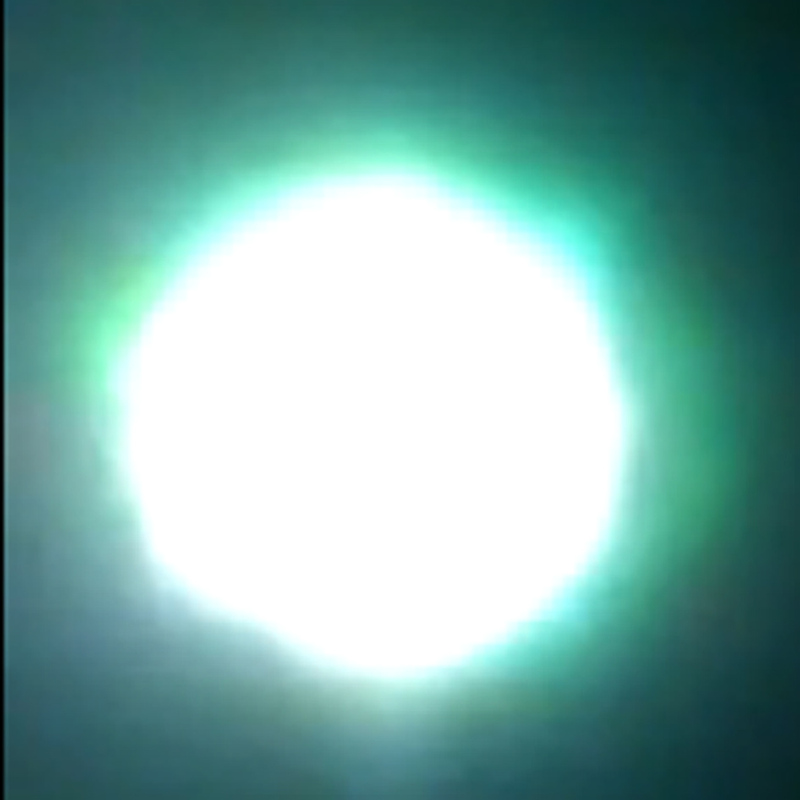 Within a few minutes it was visible again, coming back at enormous speed, much faster than an airplane, as if it was a fireball flashing through the air. I had my binoculars at hand and saw that it was a craft not known here on earth. 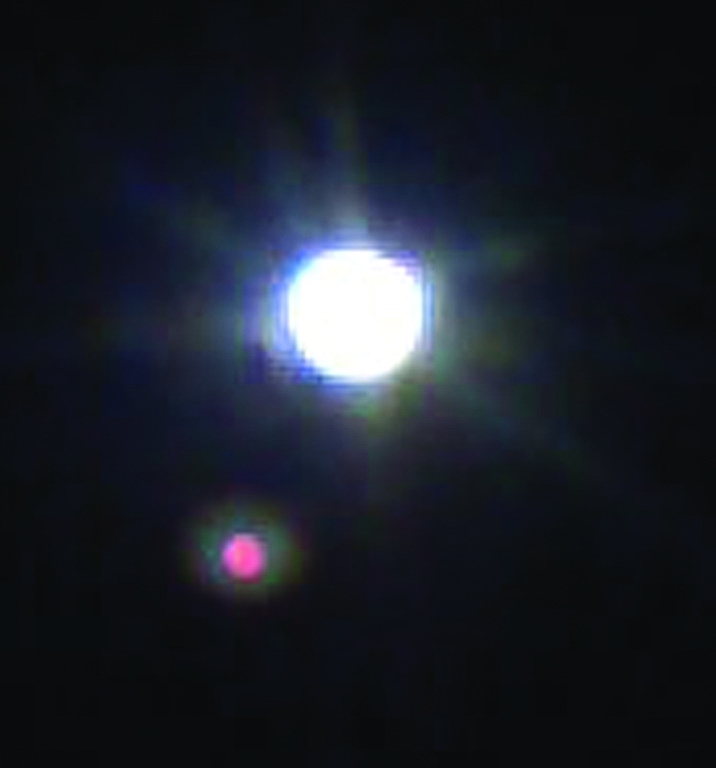 The same object was also visible on 1 January 2009 at midnight, but this time it came from another direction. Was it the star? On 31 March 2009 around 8.15pm a friend called me to my 5th floor balcony in London to see a huge, vivid, luminous, orange ball moving slowly towards us from the northwest horizon, and lit from within. My friend had just remarked that she wished the ‘star’ would approach closer. At first I thought it must be a helicopter but it was too quiet for that. It gradually approached a nearby tall building and then disappeared. We waited for it to reappear on the other side of the building but it did not. Then the same thing happened again – once more it was on the skyline moving slowly towards us. We were both spellbound, it was so beautiful. Then we saw a flame burning a golden orange colour inside, reaching up to the top. Then once more it receded and disappeared. Was it the ‘star’ we saw? I. Le G., Notting Hill, London, UK. The Dutch website Niburu has published several photographs of a chocolate bar showing the face of Jesus. The photos were sent by a Dutchman, only identified as Mart, who said he was amazed when he took a bite and then saw a face in the bar. While Mart admits to being slightly sceptical, his colleagues were convinced they could see the face of Jesus. 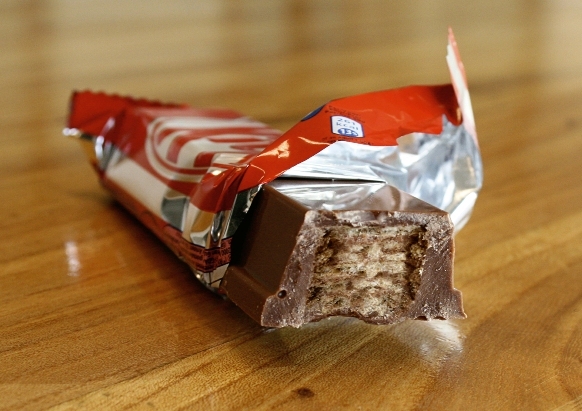 The website shows the image on the KitKat bar next to an image of the face of Jesus on the Turin Shroud. The resemblance is remarkable although, obviously, the two images differ enormously in size. A 9-year-old Indonesian boy is having problems getting to school, because he is being besieged by thousands of people seeking healing from his magic stone. Ponari, a school boy from Balongsari, a village on the island of Java, was struck by lightning in January 2009. When he awoke, a stone was lying on his head. He threw the stone away, but it came back so he took it home with him. He discovered the healing properties of the stone when a village boy’s fever subsided after Ponari had touched him, the village chief was cured of a nagging pain in his arm, and a chief of police, a devout Muslim, claims to have witnessed how Ponari healed a boy who had not spoken a word in five years. Never before have I had a subject so completely engulf my attention. At this point this evening I have read, I believe, every page of this website. Its articles, background and philosophy has me so intrigued I had to write. I also, have never once in my entire life, heard of this Teacher ‘Maitreya’. I have never heard of this because I have been raised a United Baptist Christian. However, I may have felt him. I actually held an ordination as a minister in a small association of churches in Kentucky from 1996 to 2002. We believed there is only one true God and that there would be many come saying they are He. That Satan will appear as a beautiful and convincing deceiver of the people, projecting and promoting peace for the sole benefit of distracting Christ believers and drawing them away from the way and leading them down a path to the destruction of their souls. However, while reading this very eloquently and beautifully delivered philosophy, I have realized that there may be a reason that I drifted away from that particular church and their directive. I will explain. Shortly after receiving my ordination from the church to present myself as a minister of God, I had a very vivid dream. This dream revealed itself a second time through a very strong spirit while at a very spiritual annual meeting of our association. Most of the members of the sister churches were present as the church sang a song near the end of the meeting. It was at this point that I was led by the spirit to reveal my dream to the congregation. Unannounced I began to preach my dream to them as the song ended. The vision was of myself standing on a very small peninsula that reached out into the waters of a large farm pond. On one side of this peninsula was clear clean fresh water, but on the other side the water was dirty, algae-covered and void of life-preserving oxygen. I saw an old fish, deformed and dying, his head sticking out of the water gasping for air and unable to move. Then a new, younger, stronger fish emerged and leaped out of the water and over the narrow piece of land on which I stood, to the other side where the water was clean, and happily swam away. As I delivered this sermon from the spirit with power, I could feel that this church may be represented by the old fish as I did not feel this spirit was received by the old elders of the church. I almost felt from their vibes as they listened, as if I was being chastised for this. It was not long after that that I withdrew my membership as I was being snubbed and verbally chastised by some of the members on just about every subject and sermon that I delivered. I have had many other visions and messages shown to me since then. I have also recently been a victim of a worsening economy that ended in my separation from the retail auto industry. I have gone back to school to study history as I have very recently had a strong desire to teach. I want to have an impact on the young mind. I see things on a much deeper plane than some and it seems that, for now, the only way I can communicate them is through writing. This ability to see ‘wrong’ in our society, from the economy to things philosophical and political, as well as natural sense, has frustrated me as I can see the end result of the misdirection of our societal ways and have no outlet to tell people what I see. I have said all of that to say this. It seems that all my life I have been looking, searching for something to settle me. I believe that I may have been shown that something when I read through this website. My life has been scattered with confusion and I have drifted from job to job and town to town dragging my family along who, by some miracle, has always stayed true to me. But I have been looking for something to believe in. I need it desperately to put me at peace with myself and to settle into a directed last half of my life. Can this really be happening? Have I found it? I can’t even recall how I found this website. All I know is that I am here. As I sit here contemplating if I should actually send this letter I find myself thinking about other times I have written a letter of this magnitude. Most attempts ended with the ‘comment form’ response saying that I have too many characters. However, I am compelled to find an email address to send it to if that has occurred. Sincerely pleading for a response. One evening in February 2009, my brother Frank and his partner Barbara got a surprise when they were preparing a meal at their house in Cheshire, UK. 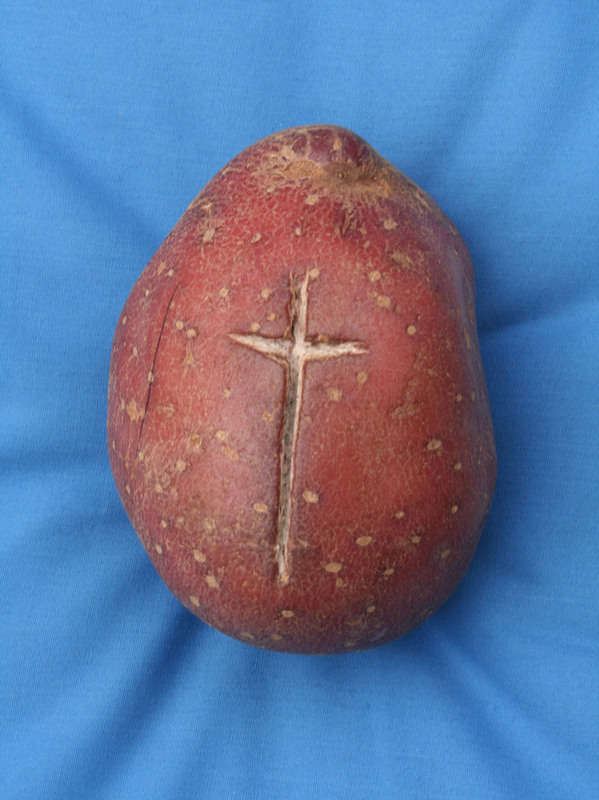 Barbara noticed that one of the potatoes had a pronounced cross on the outside. They were baffled by the discovery, particularly as the cross was perfectly formed and striking in appearance. They put it aside, wondering what the explanation might be. Several days later, though still without any answers, they felt that the “mysterious cross” had something about it. Could the Master please say who was behind it? Since 1987, we have hosted a Transmission Meditation group in our apartment in Lyon, France. In May 2007, a man called Arnaud de Beauchamps telephoned me to take part in our group the next Wednesday, telling me he lived locally. He was with us that day and was the last to stop meditating. Afterwards, he commented on my son’s book which he picked up from the table. He started a conversation: “Do you know Agartha?” I said it was the legendary city in the centre of the Earth and that I believed it was an advanced society. He didn’t respond to that but asked: “What do you think about the space brothers?” We talked about their appearances and their beneficent work. Then he left. The following Wednesday he called to say that he would be late – he was in a traffic jam – and was sorry to disturb the group. I told him: “If you come after Maitreya’s message but before the Great Invocation no one will be disturbed.” Just before the Great Invocation, I knew he was at the door, even though he didn’t ring! There he was at the door! He sat in the same place, and stayed again until the end. He saw a photograph of Sai Baba, and another of Maitreya in Nairobi. He said firmly: “Maitreya is that man in white.” We talked about Avatars, planetary and cosmic; he asked why has Maitreya come, what is His mission, His purpose and priorities? He left half an hour later, saying “Goodbye Suzanne,” with a marvellous smile. He was about 40 to 45 years old, over six feet tall, with short brown hair. He never came back to the group. Was that man Maitreya or a Master? My father is a member of a Transmission Meditation group here in the Philippines. They even have a radio programme every Sunday with various topics about the coming of Lord Maitreya. I believe that it really makes a big difference if we allow our minds to be open to the idea of accepting Maitreya and I sometimes speak about Him to my husband, co-employees and friends. I just want to ask about an experience or maybe it is just a simple coincidence? I was married in January 2006 and desperately wanted to have a child because of my age. I had a print of Maitreya’s ‘Hand’ and placed my hand on it and wished for a baby. After a few months I got pregnant and it really made me happy. I wonder whether this was just a coincidence, but no matter, I still believe that He always has a way of helping people. I hope to keep spreading the information about the Day of Declaration. In what organizers called “the world’s largest demonstration of public concern about climate change,” hundreds of millions of individuals and businesses worldwide turned off their lights for one hour on 28 March 2009 as a symbolic action. What began in Sydney, Australia, two years ago has now become an annual Earth Hour event with over 4,000 cities in 88 countries participating. Many global landmarks such as the Golden Gate Bridge in San Francisco, the face of the Big Ben clock tower in London, the Egyptian pyramids and the Sydney Opera House went dark during the hour. It is hoped that this grassroots action will send a message to world leaders scheduled to meet in Copenhagen, Denmark, in December 2009 for a summit conference on climate change. Deforestation accounts for about 20 per cent of the world’s greenhouse gas emissions, largely due to the cutting and burning of old-growth tropical forests. Deforestation was not included in the Kyoto Protocol on climate change, which expires in 2012, and urgently needs to be addressed, say scientists. The UN’s climate change envoy, Gro Harlem Brundtland, has strongly recommended the need for incentives to encourage developing countries to use forests in a sustainable way. Advances are being made in the use of hydrogen as a clean, sustainable fuel, a major goal of renewable clean energy research. After 25 years of research US scientists can now say with certainty to what extent city air pollution impacts on average life expectancy. The research, carried out by the Environmental Health Department at Harvard School of Public Health in Boston, examined changes in air quality in 51 American cities starting in the 1980s. Factors, such as diet, healthcare, improved lifestyle, certainly contributed to an increased life expectancy by more than two-and-a-half years, with cleaner air being the cause of at least 15 per cent of the extra time added to life expectancy. If this same research were to be applied to heavily polluted cities, says Dockery, such as Beijing or Mexico City, the impact of pollution would cut life expectancy. “We would be talking about several years,” he said. “Three to four years – a significant change in how long you live for. Latin America should play a central role in the creation of a new world economic order, says Brazilian President Luiz Inacio Lula da Silva. In his opening address to the World Economic Forum regional meeting in Rio de Janeiro, in April 2009, Lula criticized the world’s richest nations for sparking the global financial crisis. “We cannot become prisoners of old paradigms that have collapsed in the last months,” he said, adding that Latin America has “the credentials” to propose a global financial system that would not “be synonymous with unleashed speculation, easy profits and socialization of the losses”. The General Assembly has just approved a resolution inviting leaders of the 192 United Nations member states to a summit on the global financial crisis in June. The resolution, adopted by consensus, authorizes a conference “at the highest level” at the UN in New York from 1-3 June 2009 “on the world financial and economic crisis and its impact on development”. The President of the 63rd session of the United Nations General Assembly, Miguel d’Escoto Brockmann, called on the international community to “participate to establish a more just, and more sustainable, financial and economic system”. A veteran statesman, politician, community leader and priest, Father d’Escoto served for over a decade as the Republic of Nicaragua’s Minister for Foreign Affairs. “In the midst of the most serious economic downturn since the Great Depression, we now have the opportunity and the responsibility to search for solutions that take into account the interests of all nations, the rich and the poor, the large and the small.…This is the mission of the G192. Miguel d’Escoto talked of the need for a united approach: “We face a global crisis that requires a global solution. All of us are affected by the breakdown of the financial economic order, and all of us must participate to establish a more just, and more sustainable, financial and economic system. “In agreeing to hold this United Nations conference at the highest level, Member States are recognizing the vital importance of assuring that all nations have an opportunity to participate equally and fully in the common search for solutions that meet the concerns and needs of all countries, large and small. In March 2009, an expert panel stressed that international finance structures must be drastically overhauled in the face of the current global economic crisis, calling on wealthier nations to direct one per cent of their economic stimulus packages to help developing countries address poverty. A co-ordinated approach – bringing together not just the G8 or even G20 nations, but the “G192” representing all members of the Assembly – is needed to pull the world out of the recession, according to the recommendations of the Commission of Experts on Reforms of International Finance and Economic Structures. While many working people in the world’s rich countries bemoan the loss of their bonuses or worry about possible job cuts, millions of their counterparts in poorer nations are going to bed hungry. Food prices remain higher than before the food crisis in 2008. Many countries are running out of the foreign reserves needed to buy food and, as a consequence, the number of victims suffering because of the shortage is rising. Earlier this year Kenya declared a state of emergency with about 10 million people at risk because of hunger. As developing countries struggle with the survival of their citizens because of food shortages, some rich countries are not fulfilling their promises to help ease the situation. So far, the UN Food and Agriculture Organization has received only 10 per cent of the aid pledged in mid-2008. The economic crisis and drought will cause Latin America’s agriculture growth this year to drop to half its average rate from that of the past five years. Food production in the US and Europe has been affected by the credit squeeze. Food resource constraints, growing population and rising demand, could mean more soaring food prices. Paul Krugman, the 2008 Nobel Prize winner for economics, warned in March that 2008’s increase in food prices was not a speculation-induced false alarm. Violence last year erupted in more than 30 countries from the Caribbean to the south Sahara amidst soaring food prices. Food problems could eventually take a toll on global security.